This date slice is so deliciously moist and tasty, it belies how easy it is to make. There’s no creaming of butter and sugar or melting of butter because it contains no butter. So where does the slice get its moistness and flavor from? From the juice of the fruit and yogurt. I used vanilla flavored yogurt rather than essence, which gives it a delicate vanilla flavor. Perfect. Preheat the oven to 180°C/ 350°F. Line a 28 x 18 cm / 11 x 7 inch shallow baking pan with parchment paper, making sure two sides overhang the pan. This will make removing the slice easier later. You will need to use ready-to-eat dried dates. If you can get pitted dates, even better. Chop the dates into small pieces. Place the dates, sugar, flour, muesli, sunflowers seeds, poppy seeds, sultanas, yogurt and beaten egg into a large mixing bowl. Using a large wooden spoon mix together until all the ingredients are combined, but don’t overmix. Spoon into the prepared tin making sure that the mixture is evenly spread and reaches all the corners. Use the back of the spoon to smooth over the top. Bake in the oven for about 25 minutes or until the top is golden brown. Remove from the oven and then leave to cool in the tin. While you may think that topping it with icing is not particularly healthy, it definitely lifts the slice, giving it a lemony tang. You don’t have to use much, just spread it over sparingly. Place the confectioners sugar into a small bowl. Stir in sufficient lemon juice to make a spreading consistency. Add the lemon juice a little at a time, until the icing is spreadable. If the icing is too runny add more sugar. 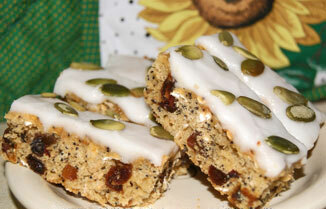 Spread the icing over the cooled slice and sprinkle with pumpkin seeds. When the icing has set lift the slice out of the pan using the parchment paper. Place on a board and using a sharp, serrated knife, cut into bars.